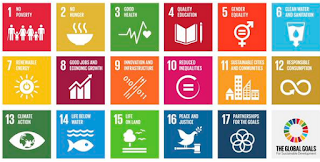 I had missed Bjorn Lomborg’s article in the Guardian "These are the four SDGs we need to agree on to help the planet" in the section sponsored by Business call to Action. I can only hope that someone else decided on the title as it clearly indicates a lack of understanding what a target and a goal is. This was as I am sure many of my readers would appreciate was because I was recovering from the over two weeks of negotiations on the final text for the Transforming Our World: The 2030 Agenda for Sustainable Development. I didn’t see Bjorn there at all maybe I missed him. There was a little haggling and horse-trading for the Declaration in the last few weeks of July but in most cases for the better see my review. In the case of the original SDGs and targets agreed last year the reason that we have 17 goals and 169 targets is because of what I have said a number of times. The MDGs were for developing countries and the SDGs are for ALL countries. The MDGs were just addressing development and the SDGs are addressing SUSTAINABLE DEVELOPMENT. The MDGs dealt with the impacts of policies and the SDGs address the root causes. Bjorn suggests that for targets are the most important and claims because he has asked: “60 teams of top economists, including Nobel laureates Finn Kydland and Thomas Schelling, to evaluate the economic, social and environmental costs and benefits of the proposed targets,” that there answers in some way should be our guide. I am not going to comment on the four targets because it’s not for self-proclaimed experts to decide these things but for national processes to decide which they want to priorities for themselves. What is critical for a country like Jamaica will be different Denmark will be different from India. We have still a lot of the infrastructure for the SDGs to be put in place. This next 8 months the global indicators will be agreed. The next meeting is in Bangkok on October 26-28th of the IAEG-SDG group which will produce its report by December for a March UN Statistical Commission meeting. These will be a set of global indicators probably between 100-300. Each country will in addition produce its own set of indicators and stakeholders will be developing their own citizen data sets, industry their own versions of the indicators for their use in reporting. Bjorn is right some of the targets will be more cost effective in collecting data but that should not be the indicator – for far too long NOT enough money and resources has been put into collective more effective data and that needs to change anyway. Investing in data collection will help make better informed policy decisions in the future. To help the follow-up and review at the HLPF it will be informed by an annual SDG Progress Report (similar to the MDG Progress report over the last 15 years) to be prepared by the Secretary General in cooperation with the UN System, based on the global indicator framework and data produced by national statistical systems and information collected at the regional level. Over the next six weeks I expect to see more of these types of articles. What we should be focusing on is not the past debate but the future implementation of this transformational agenda. Finally lets hope that the very good Danish PGA does not have pressure to undo the implementation of a universal, indivisible, integrated 2030 agenda by bringing Bjorn in!!! It would be a revisionist unleashed! Bjorn Lomborg SDgs Transforming Our World: The 2030 Agenda for Sustainable Development.